On 6 December 2017, exactly 25 years after Hindu terrorists demolished the Babri Masjid, Shambhu Lal Regar, a Hindu terrorist lured an unsuspecting Muslim labourer, Mohammed Afrazul, to a plot of land he owned on the pretext of some work, and then hacked him to death with a pickaxe and burned down the body. 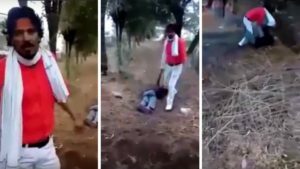 He had the entire grisly attack recorded on video on a cellphone by his minor nephew and then posted it on social media, along with videos of malicious rants against Muslims. Where this horrific killing took place is also worth noting: Rajasthan, a state under BJP rule and where a number of killings of Muslims by “gau-rakshak” thugs had preceded this killing. Shambhu Lal Regar is no mentally unbalanced killer and the killing is no random spontaneous killing. He did not know Afrazul personally or had any reason to be provoked by him, apart from being a Muslim. It wasn’t a crime committed in the heat of the moment. Shambhu Lal Regar had called Afrazul on his mobile on 5 December itself. He called him again on the morning of 6 December and lured him to his death. It was a cold premeditated act of terrorism to strike terror into the hearts of Muslims in Rajasthan, particularly migrant Bengali Muslim labourers who came to work there from West Bengal. Furthermore, Shambhu Lal Regar had also posted a video with his bank account details soliciting donations to “finance” his terrorist campaign against Muslims. Three days later, on 9 December 2017, Gujarat went to polls as its first phase of voting took place. Reportedly, 516 people from across India donated approximately Rs. 300,000 into his account within days. Messages soliciting money for Regar’s family was vigorously circulated on social media. 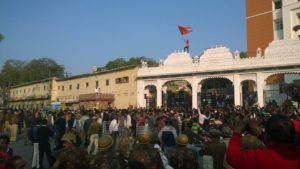 On 14 December, Hindu terrorists openly staged a demonstration in support of Shambhu Lal Regar and clashed with police. The telling image was that of such a terrorist atop the main entrance of the District & Sessions Court, Udaipur, waving a bhagwa, just as polling in Gujarat ended with the conclusion of the second & final phase of voting. Four days later, on 18 December 2017, votes were counted and BJP once again rode back to power, although with reduced number of seats, in spite of 22 years of misgovernance and subversion of democracy in every manner. But we did not reach here overnight, or only after Modi got elected as the Prime Minister of India in 2014. This road to self-destruction began long ago. For decades, RSS and its hydra heads spread its roots through “social work” into communities that anyway received little in terms of access to services that the state was supposed to provide. These organisations organized religious and cultural events, helped in times of natural calamities, and earned legitimacy within the communities. Most importantly, they established schools and provided education. While doing so, it also insidiously injected vile communalism and Hindutva ideology, playing on the insecurities and latent anti-Muslim prejudices of many ordinary Hindus and nurturing and organizing those into more potent forms. Much of this happened under the watch of the Congress at the Center and States. What shouldn’t be forgotten is that the Congress didn’t play the role of passive non-action, but actively collaborated with the proponents of Hindu Rashtra. Who opened up the Babri Masjid to allow Hindu Rashtra proponents to worship inside the Babri Masjid in 1986? Rajiv Gandhi and Arun Nehru. Who was the Chief Minister in UP? Bir Bahadur Singh of the Congress. Who allowed the foundation stone for a temple to be laid inside Babri Masjid, in violation of court orders, in 1989? Rajiv Gandhi and Arun Nehru. Who was the Chief Minister in UP? N.D. Tiwari of the Congress. In fact, Buta Singh, Union Home Minister and N.D. Tiwari, Chief Minister of UP, were both present for the laying of the foundation stone. On 9 November 1989 Congress allowed Vishwa Hindu Parishad to lay foundation stine for a Ram Temple in the Babri masjid premises and in the general Elections for the 9th Lok Sabha on 22 & 26 November 1989, BJP for the first time ended up winning 86 seats and became a political force to recon with. If this wasn’t enough, one should not forget that the Hashimpura Massacre of Muslims in UP and the Bhagalpur Riots in Bihar had been inflicted under the watch of the Congress in center as well as the states. Shortly after its spectacular rise in the Lok Sabha, BJP won a State Assembly Election in June 1991, winning 221 seats out of 425 in the UP Assembly Election for the first time and formed the government. Barely one and a half years later, with a BJP Government in UP, and a Congress government at the Center, on 6 December 1992, the Babri Masjid was demolished with complicity of the closet Hindu Rashtra that the Indian state had become under Congress and BJP. It was an act of terrorism for which the RSS/BJP and all its affiliates should have been banned and its leaders and members prosecuted under India’s terror laws and convicted for long terms in prison, if not hanged to death. Instead, every individual and institutions in the highest echelons of the government not only treated them with velvet gloves but actually legitimized their terrorist ideology to let one of them rise to become India’s Prime Minister 22 years later. BJP won its second state in 1995 in Gujarat, and has held on to it ever since. The only spectacular achievement of the BJP/Modi in Gujarat has been the pogrom of Muslims in 2002 for which he became the “Hindu Hriday Samrat”. For 10 years, from 2004 to 2014, Congress again headed the Central government in Delhi. Instead of cracking down on Hindu terrorism of the RSS/BJP, it pussyfooted and allowed this monster to grow. The instances are just too numerous to recount when it could have acted but didn’t. And we are too celebrate that in yet another election the Hindu terrorists won 99 seats, less than it had won previously, and that Congress under Rahul Gandhi had bettered its tally? Shouldn’t these Hindu terrorists be in prison rather than contesting elections and forming governments? This is the reason why a Shambhu Lal Regar can kill a Muslim with impunity, post gruesome video of the killing on social media, and even solicit for more funds to finance his terrorist campaign. THIS is the reason why Hindu terrorist supporters actually donated him money. THIS is also the reason why BJP/Modi yet again won an election in Gujarat. Congress had allowed RSS/BJP to create and nurture an environment where killings of Muslims was not only legitimized, but also celebrated and glorified. A Modi or a RSS chief may not have directly ordered Shambhu Lal Regar to kill Afrazul, but he certainly felt emboldened to do so, and even considered himself a hero for doing so for the “enabling environment” of the perceived Hindu Rashtra that these Hindu terrorists have created and vigorously nurtured. This is exactly similar to radicalized Muslims with no direct connection to Islamic State carrying out terrorist attacks on civilians by driving a truck into a crowd or carrying out mass shooting or stabbing attacks. Because there are Hindu terrorist supporters who readily contributed to Shambhu Lal Regar’s appeal for donations to finance his terrorist campaign against Muslims, there would also be substantial number of such terrorist supporters who would vote for BJP. It matters not what hardships they faced due to demonetization or due to messing up the economy so long as India can be turned into a Hindu Supremacist State. Because the Congress had been a complicit ally in this project, it can never be the political force to defeat these fascists. Congress’ insidious soft Hindutva cannot be the alternative to BJP’s brazen genocidal Hindutva. There are many well-meaning people who support the Congress against the BJP. My appeal to them is to read this and engage with these facts with reason and logic and explain to me how could a Congress, with this disturbing history, be the alternative to the BJP? Be the first to comment on "How or why could Modi/BJP win again in Gujarat in spite of 22 years of continuous misgovernance, which has left all human development and economy in shambles?"